Removal and replacement of six large precast concrete staircase units weighing up to 32 tonnes. Six highly trained PCE team members, 200 tonne mobile crane executed the project over two weekend night time road closure possession periods. Manufacture of units involved casting them tread down in high quality engineered timber moulds prior to turning through 180 degrees for delivery and erection. Project completed within programme without causing overrun of night time road closures. 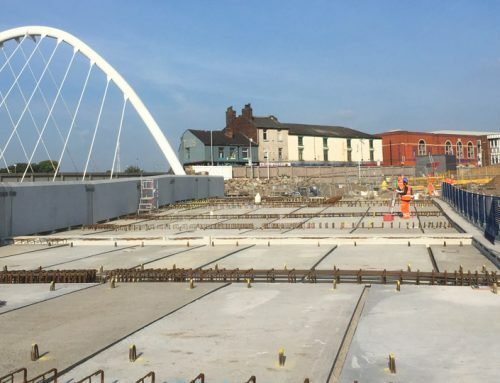 Six new precast concrete stairway units weighing up to 32 tonnes were manufactured and erected as part of the upgrading of the Clifton Road Bridge between Beechwood and Cholmondeley Road in Runcorn. The work was part of the Mersey Gateway Project, linking a six lane toll bridge across the River Mersey linking Widnes and Runcorn. 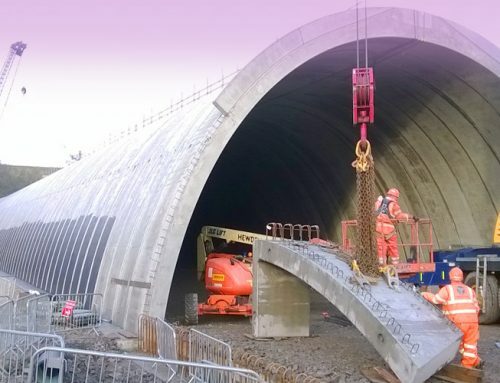 Runcorn based civils contractor VolkerLaser worked on 24 structures for the project’s Main Contractors, Merseylink Civil Contractors Joint Venture, a consortium that comprised of Spanish Contractor FCC Construcción S.A., Kier Infrastructure and Overseas Ltd, England and the Samsung C&T Corporation of Korea. VolkerLaser appointed PCE Ltd to carry out the removal of the existing six large precast concrete staircase units and supply and install their normally reinforced precast concrete replacements. The six new precast concrete units weighing up to 32 tonnes were manufactured by casting tread down in high quality engineered timber moulds and then turned through 180 degrees before being delivered to site – see images (above) and video (right). 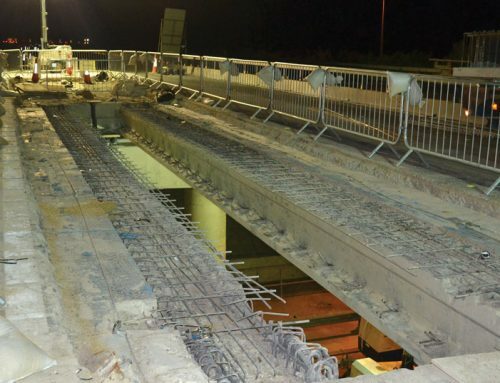 PCE carried out the removal and installation of the stair flights over two weekend night time road closures using a 200 tonne mobile crane and a maximum of six highly trained PCE team members. The video below shows the turning of large precast stair units prior to delivery to PCE. Video courtesy of SWP Concrete Solutions.